The closure timeline of Germany’s 17 nuclear reactors has become a defining issue in German politics and has threatened to destabilise Angela Merkel’s presidency. In response the German government has recently announced the closure of all nuclear plant by 2022. And in order to replace the retiring nuclear capacity the German government will focus even more on delivering new renewable capacity. 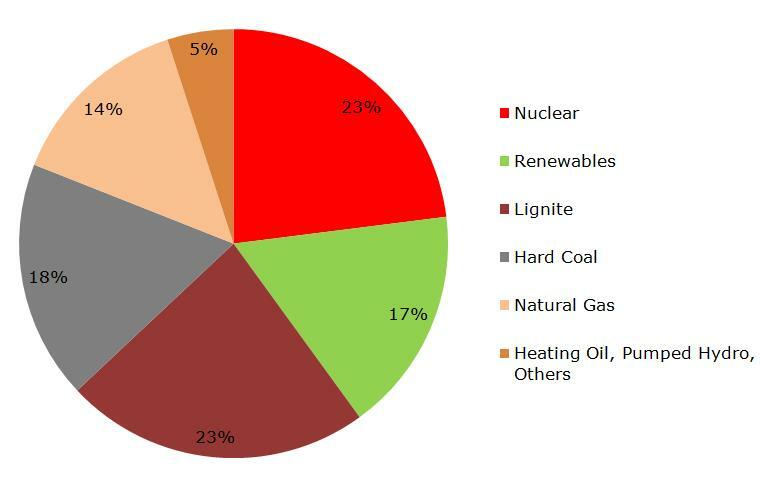 Replacing nuclear with renewable capacity is an appetising vision for politicians to sell to the electorate, but the reality of its implementation is likely to result in some less palatable side effects for the German decarbonisation agenda and power market stability. It is only 25 years since highly radioactive caesium isotopes from the Chernobyl explosion fell over Germany. So it is understandable that the German public expresses strong negative sentiment towards nuclear power. The closure timeline of Germany’s 17 nuclear reactors has become a defining issue in German politics and has threatened to destabilise Angela Merkel’s presidency. In the last few weeks, in an attempt to seize the political initiative, Merkel has reversed her coalition government’s 2010 decision to grant a 12 year average lifetime extension to the German nuclear fleet. In her new announcement seven of the oldest nuclear plants, which have been temporarily closed since the Fukushima accident, will now close permanently. 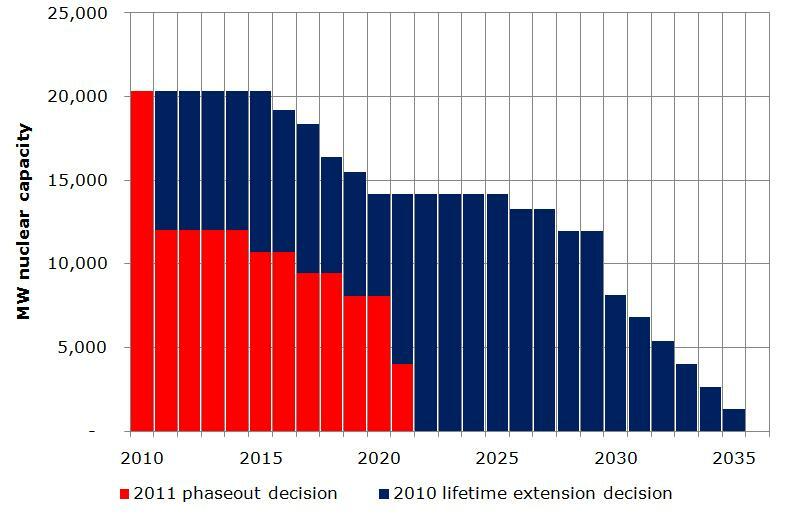 The remaining nuclear plant are scheduled to close gradually between 2015 and 2022 as shown in Chart 1. And in order to replace the retiring nuclear capacity the German government will focus even more on delivering new renewable capacity. Replacing nuclear with renewable capacity is an appetising vision for politicians to sell to the electorate, but the reality of its implementation is likely to result in some less palatable side effects for the German decarbonisation agenda and power market stability. It is useful to consider the market impact of nuclear plant closures over two different time horizons: the three year forward curve horizon and the 10 to 20 year investment horizon. The forward curve horizon impact of closures is mitigated by the fact that Germany currently has a substantial surplus of generation capacity. This surplus is primarily the result of generous support for renewable generation via the German Feed in Tariff (FIT) mechanism (particularly for solar capacity which increased by 7GW in 2010 alone) combined with a financial crisis induced reduction in demand. Even with 8 GW of nuclear capacity removed this year as a result of the closure decision, the capacity margin in the German power market (de-rated for availability issues such as renewable intermittency and thermal outages) is comfortably above 20%. Surplus capacity is evident in the fairly benign reaction of forward market thermal generator margins to the nuclear closures. Clean dark spreads have recovered from very depressed levels since Fukushima but are still at levels (around €8/MWh) which are below levels required to recover the fixed costs of existing plant let alone support new capacity build. A more interesting impact of the closures from a hedging and risk management perspective has been the increase in the correlation of coal and power prices as coal capacity exerts a greater marginal price-setting influence. Somewhat ironically, given the environmental context of the nuclear closure decision, the other more immediate market impacts have been to increase German carbon emissions and increase imports from Germany’s nuclear dominated neighbour France. These unwelcome effects are likely to remain for years to come. By 2022 when the last German nuclear plant is scheduled to close, the market impact of the nuclear closure policy will be far more pronounced. Nuclear generation, which is reliable, baseload and low variable cost, currently accounts for around a quarter of German power generation as shown in Chart 2. The German government is pinning its hopes on renewable capacity and energy efficiency measures, while trying to limit the emissions impact of new thermal capacity and Germany’s dependence on carbon and nuclear intensive foreign imports. While it is theoretically possible to realise this vision, there are some very difficult practical issues with implementing it. Germany’s target to generate 35% of electricity from renewable sources by 2020 (up from about 17% today) is an extremely challenging undertaking. There is a massive technology and infrastructure investment challenge in achieving this target. Offshore wind generators and transmission capacity, only delivered on a relatively modest scale to date, will need to play a pivotal role. If Germany manages to deliver renewable capacity of this scale, it faces a second challenge of ensuring that the system has access to enough generation flexibility to support the swings in output from sunny, windy days to the cloudy doldrums. Replacing nuclear baseload generation with intermittent renewable capacity makes this challenge more difficult. While in theory carbon friendly flexibility could be provided by improved interconnection to hydro generation in Scandanavia and the Alps, it is far from clear whether market price signals will support the delivery of this capacity. It is not even clear to what extent coal and gas generator margins will recover to support the commissioning of new thermal capacity. Market participants may well find that the cheapest and most accessible source of flexibility comes from extending the lives of their existing thermal plant. The German government is likely to find that its headline objective of replacing nuclear with renewables capacity has the unpleasant side effects of the lifetime extensions of carbon intensive plant and an increase in Germany’s dependence on foreign imports. Looking through the political vision and confronting reality, flexible thermal capacity will play a key role both inside Germany and across its borders. How to quantify and monetise the value of that flexibility will be a key challenge for investors and asset managers. This subject is explored in more detail in an article to follow shortly.